What’s Happening to My ears? You might not realize it until your earlobes turn red and itch, but you may have an earring allergy. No one likes to put on a pair of pretty earrings only to discover that they cause irritation. 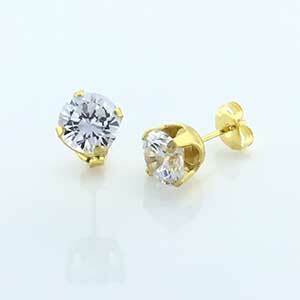 Many people rely on hypoallergenic earrings, and demand for the products is high. Nickel is one of the metals most widely used in alloys for jewelry making. Prized for its sturdiness and cost-effectiveness, jewelry makers use it often. However, it is also the ingredient in jewelry that most commonly leads to allergy symptoms. Particularly when its pressed against skin, as is the case with earrings. Metals used often in hypoallergenic jewelry include gold, platinum, copper, titanium, and stainless steel. Precious metals carry the advantages of high value, beauty, and hypoallergenic qualities, but they also command a hefty price tag. Let us emphasize, when discussing hypoallergenic jewelry made of precious metals that these are made of the pure metal. Be careful with less than pure gold or platinum items, which can have a substantial amount of available nickel as the base metal. Much of the affordably-priced hypoallergenic earrings begin with a base of stainless steel. It could be assumed that because these earrings are said to be hypoallergenic, that they are free of nickel. There is some justice in this assumption, but the fact is that most stainless steel jewelry contains at least small amounts of nickel, around 8 to 12%. However, the nickel that exists in jewelry that merits the description as hypoallergenic exists so tightly bound on a molecular level that it doesn’t behave the way regular nickel does. In a sense, it is not “available,” is not sensed by the skin, and does not cause irritation. So the answer to the above questions is … yes! Contrary to popular belief, hypoallergenic stainless steel jewelry does contain some nickel. But no, it might not matter in the sense that it will not cause an allergic reaction, because your skin doesn’t feel it. One way to prove that the small amount of nickel in hypoallergenic jewelry is not “available” is to test it for nickel. Use a simple chemical test kit to check. Many high-quality hypoallergenic earrings made of stainless steel do test negative for nickel. Therefore, you can still feel confident that the hypoallergenic earrings you own will not irritate your skin. If the nickel they contain is in a form that is “locked” and can’t cause irritation to your skin, you won’t feel the difference. This entry was posted in Articles and tagged Allergy Free Earrings, Are Hypoallergenic Earrings Nickel Free, hypoallergenic earrings, Hypoallergenic jewelry.